Start out by making your sauce by warm a small amount of sesame oil in a sauce pan. Add your ginger and garlic and gently sauté for a minute or so. Once you’ve done that simply add in the remaining sauce ingredients. Bring your mixture to a gentle boil and then reduce down to a simmer. The sauce will look thin and a little watery at first, but as your cook it will reduce down into a thick glaze. Taste and season as needed. You can add more lemon juice for extra zip, or another touch of honey if you want it sweeter. Once you’re happy with your sauce remove the pan from the heat and set aside as your prep your chicken. Cut up your chicken into bite-sized pieces if you haven’t already. Place the chicken in a shallow dish or bowl and cover with your starch. Toss until all sides of the chicken are coated in starch. When you’re ready, add your chicken pieces to a heated, oiled pan and fry. Make sure not to overcrowd your pan as you cook or you’ll struggle to end up with any crispy pieces. Let the chicken cook undisturbed for about 2-3 minutes before flipping and cooking on the other side another minute or two. When you’re ready all that’s left to do is pour the sauce over the chicken, toss to coat and that’s pretty much it! Cook another minute or so just to allow the chicken time to soak up your sauce and you’re done. If you’re looking to keep this meal paleo, low carb friendly you can serve this over lightly steamed cauliflower rice. Otherwise, you can’t go wrong serving it over the top of plain white rice. 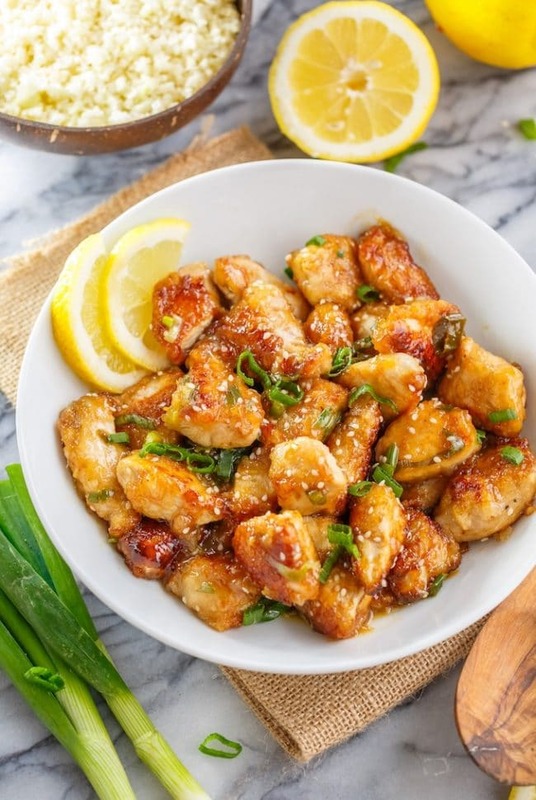 Don’t forget to #asaucykitchen on instagram if you try this Healthy Chinese Lemon Chicken! We love seeing what you make! You can also post your pictures to my facebook page! 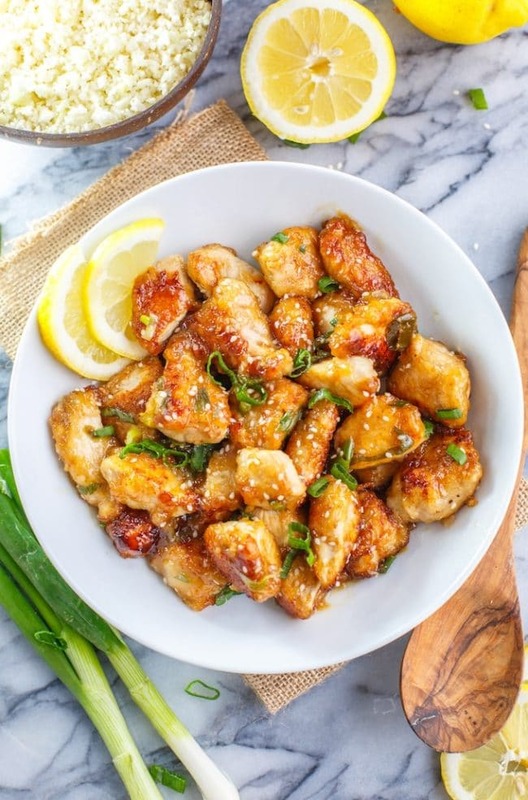 30 minute Healthy Chinese Lemon Chicken - sticky, crispy chicken pieces coated in a sweet and tangy lemon sauce. 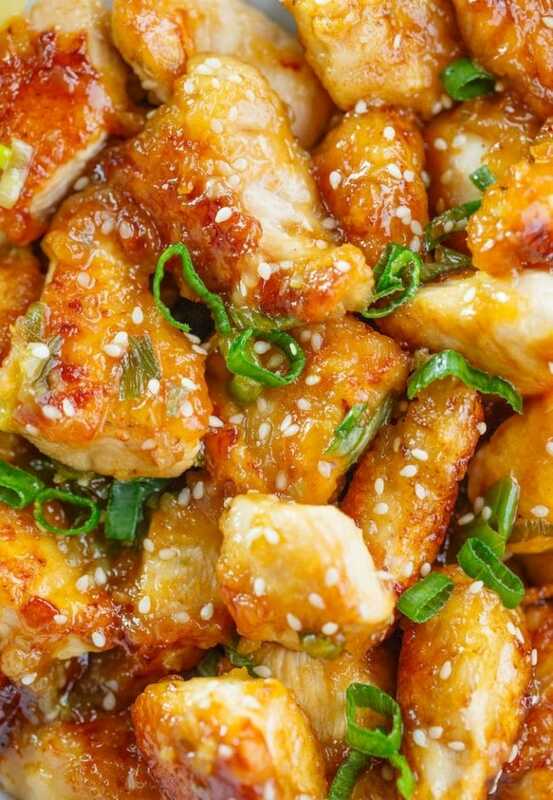 In a small sauce pot warm the sesame oil on a medium low heat. Add the garlic and ginger and sauté for a minute until fragrant. Add the honey, chicken stock, lemon juice and coconut aminos to the pot. Whisk to fully combine and bring the sauce to a boil then reduce the heat down to a simmer. Stir occasionally to keep from burning. Keep cooking until the sauce reduces down to a thick glaze - about 5-7 minutes. Place the chicken pieces in a shallow bowl or plate and toss with starch coating all sides. Try not to crowd the chicken. Add a tablespoon or two of coconut oil to a non stick skillet. When the oil is hot. Add the coated chicken. Fry over medium heat, a couple of minutes on each side until the coating begins to crisp. Continue to sauté over medium heat until chicken is browned and cooked through. Once all the chicken pieces are cooked briefly remove them from the pan. Pour out the remaining oil and wipe down with a paper towel to remove any burnt bit and leftover starch. Add the chicken back to the pan along with the sauce. Toss and cook on a low heat for a couple of minutes to let the chicken soak up the sauce. Top with sliced green onions and sesame if desired and enjoy! Your oil must be properly heated first. Before adding any chicken to your pan test the oil by getting your fingers wet with a little water and flick a few droplets into the oil. If the oil sizzles immediately it's hot enough to begin. If not, wait a minute and try again. You should also avoid over crowding your pan while frying your chicken. Too crowded and the chicken won't go properly crispy. Fry in a couple of batches if needed. You can use gluten free soy sauce/tamari in place of the coconut aminos but keep in mind that soy is much saltier than coconut aminos so you'll need to make a few adjustments. 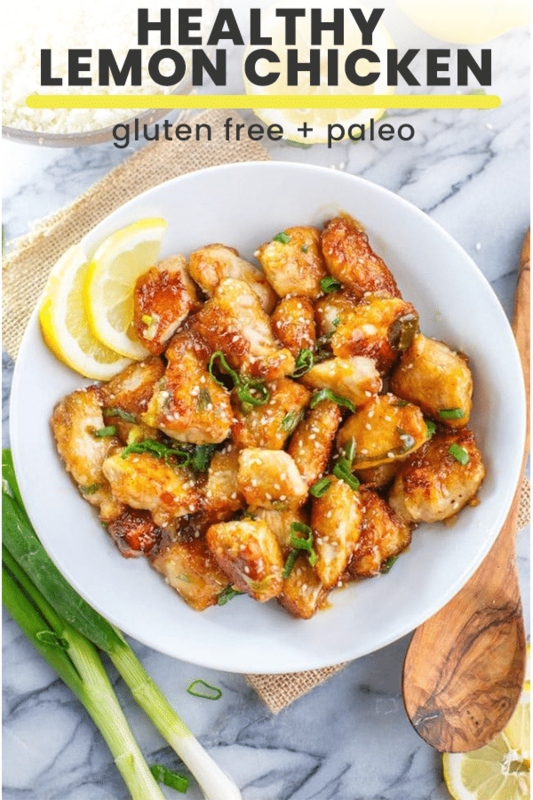 You will need to either decrease the amount of soy (1 tablespoon instead of two) or increase the amount of lemon and honey to balance out your flavours.